Ever since my roommate alerted me to a cashew pesto she and her mother enjoyed the other day, it's been stuck in my head. Today I toyed with a version of my own. Have to say, it's unlike any other pesto I've ever had -- and til now I've been partial to those of the pistachio variety -- but there's something about cashews (perhaps their inherent creaminess) that bodes especially well with this type of sauce. It's freakin' tasty. I've already tossed it with pan-roasted radishes and shmeared it on homemade bread (not to mention taking a spoon to the bowl). If it survives the night, I've got fresh pasta plans for the stuff tomorrow night. 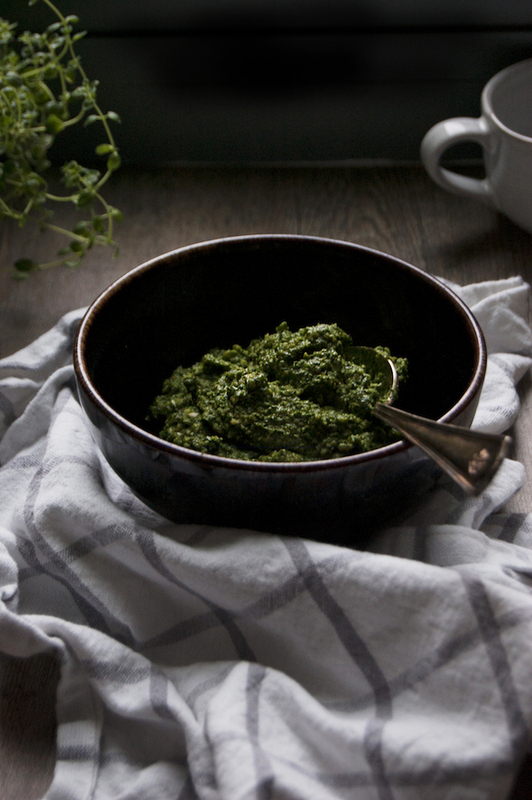 Unlike other pesto recipes, it doesn't use cheese (and it doesn't need it). Green magic from merely roasted cashews, fresh mint, raw spinach, garlic, olive oil, sea salt and freshly ground black pepper. I didn't really measure, rather, added and tasted as I manned the food processor til I found the perfect balance. I urge you to do the same. Gather the best ingredients you can (more than you think you need) and test til you get it right. Too nutty? Add more herbs. Not creamy enough? Add more olive oil. (And be sure to season generously with salt and pepper.) Have fun with it. Cooking without measurements will make you a more attune cook, trust me. I am really interested in trying this and I love that there is no cheese. I've never tried pesto with pistachios either, is there a distinct pistachio flavor? I am not sure if I taste the pine nuts in traditional pesto, rather it offers a creamy nutty texture that imagine cashews do as well. Have you tried making this with soaked cashews? It would probably be a lot creamier, not sure if that is something that would make it better though. Pistachios lend a fantastic flavor to pesto -- one of my favorites is a version with roasted kale: 1 cup toasted pistachios, 4 cups kale, roasted and roughly chopped, fresh lemon juice (from 2-3 lemons), 1 tsp lemon zest , 3 cloves garlic, 1/4 to 1/3 cup olive oil, 1/3 cup freshly grated parmesan cheese. Whirl it all up til you get the consistency you like. That's a sense of the basic ratio, but you will need to fine tune with the amount of nuts, mint and spinach as you taste, adding salt and pepper to round out the seasoning.